Hello loves! 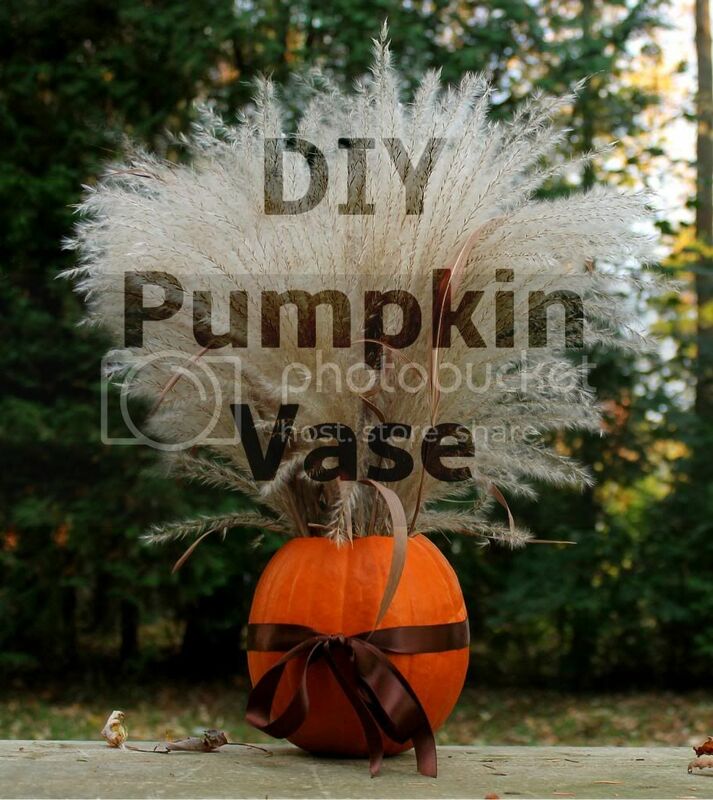 Today I'll be showing you how to create this adorable DIY pumpkin vase. It's easy enough for even the most basic carvers, and it costs next to nothing. The best part is that if you don't like the finished product, or get sick of it, you simply take off the embellishments and carve like you normally would! With a carving knife or serrated steak knife, cut a circle around the stem of your produce. Be sure to gauge the diameter according to the density of your filler (tight for thin filler, spacious for dense filler). Next, take a grapefruit spoon (serrated edges), pumpkin carving spoon or regular tablespoon and carve out your guts. After cleaning your pumpkin, choose your filler. I used Bears' Grass for mine (borrowed from the back roads), but anything can work; a fall flower bouquet, decorative branches, or even assorted pine cones. Lastly, choose a ribbon that will work with your colour theme. This brown ribbon is from Michael's, and was outrageously overpriced; go to the dollar store, it's the same thing! That's all there is to it! If you like the idea but not the style, try varying the size, shape, and colour of your pumpkin (they have pink now!). Also, try different fillers and embellishments according to your taste. Thanks so much for reading! Please let me know if this information was helpful, as your interest and support motivates me to think up more great ideas. Like usual, have a wonderful day!